The meeting point had to be Jamie’s at Gatwick for a stamina giving breakfast. Once we landed in Bordeaux and met the wagon that would be our office-from-the-office for the next seven days we were driven, by the lovely Helen, up to Chateau Quintus in St. Emilion to taste the full range of Domaines Clarence-Dillon wines with Jean-Philippe Delmas. Quintus was once both Tertre-Daugay and L’Arrosee in St. Emilion. 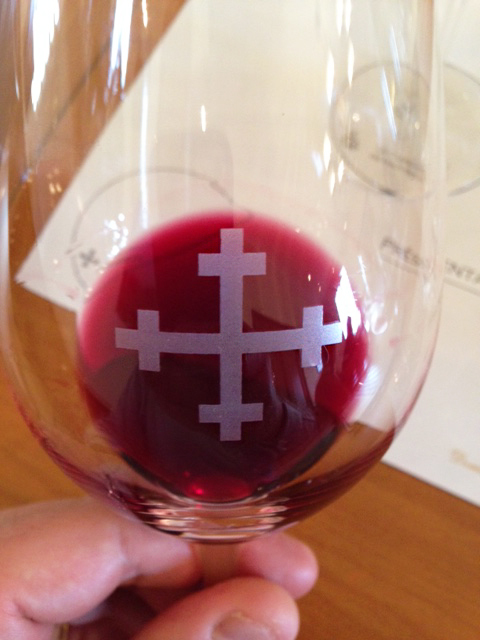 We tasted through the Quintus and Dragon de Quintus from 2011-2014 and the progression is fascinating. 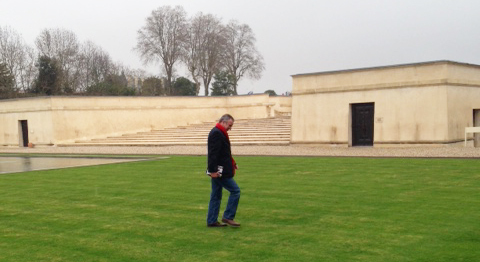 It was then time to taste the Haut Brion Stable – arguably we were going in at the very top. The wines were as impressive as you would hope, La Mission Haut Brion just pipping Haut-Brion for me but the opposite for one or two others… the dry whites showed excellent clarity, intensity and also purity… an exciting start to the tastings! We then had a glass of champagne before a cracking lunch with some wonderful wines: the Haut Brion whites from 2011 (coming along very well) and Tertre Daugay 2009 – voluptuous, and the L’Arrosee 2001 – all truffles and degraded sweetness. 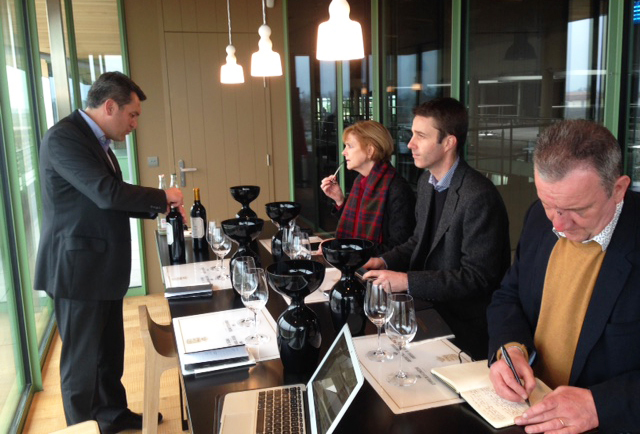 We made the trip around to Pauillac and tastings at both ‘Pichons’ and Leoville-Las-Cases. Mr Marus ignored the ‘Keep off the grass’ signs at Pichon Baron as the drizzle which is due to be with us until Wednesday started. The tastings at these three estates were good and more importantly encouraging for the vintage. At Pichon Lalande both wines were impressive, the harvest here was over the slightly ridiculous, span of 5 weeks! Pichon Lalande itself was silky but very much a Pauillac – a hard trick to pull off. On to the last tasting at Leoville Las Cases which is always slightly like a trip back to the late 70’s. The Grand Vin was mightily impressive and a ‘Vin de garde’ that may be most enjoyed by my son rather than me. A weary wagon then made its way back to Bordeaux for the essential end of day beer before the arrival off the plane of Adam, Percy and Bryce. They had bumped into a certain MW wine writer at Gatwick who has waved at them from the ‘executive lounge’. 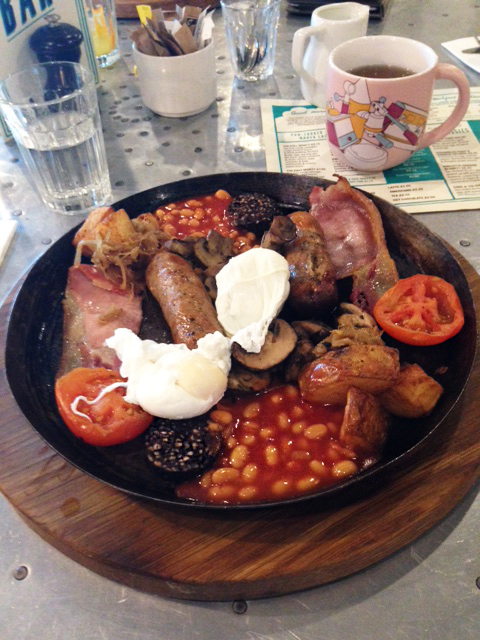 Much ‘banter’ was dispatched – and returned, I believe. A relaxed dinner, most notbale for ‘Uncle’ Paul declining a starter, was enjoyed at Le M de Monbadon, 50 yards from our hotel, before the sack was hit… day 2 will come at you from the right bank… stand by!